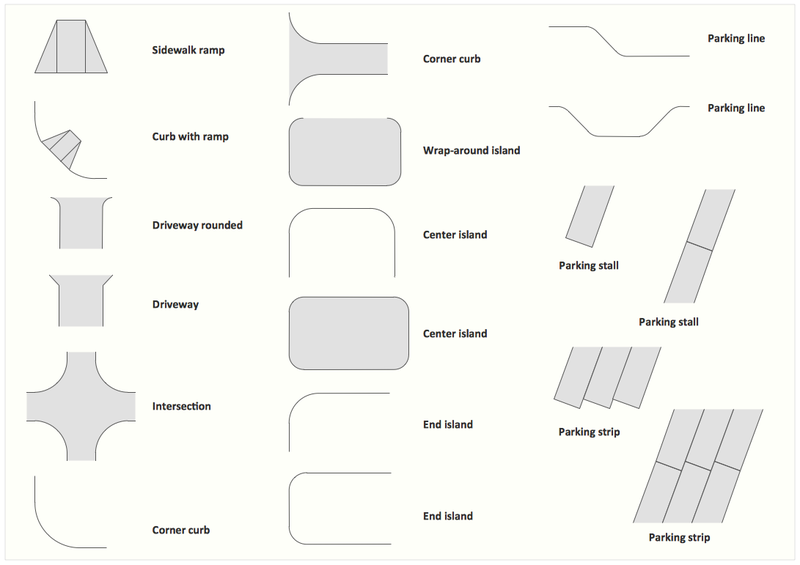 The vector stencils library Parking and roads contains shapes of parking lots and strips, parking spaces, driveways, street junctions, and interchanges for drawing site plans of parking facilities, on-street and off-street parking, and traffic management. The library Site accessories contains shapes of vehicle access control equipment (tollbooth, tollgate, parking fees payment box), a handicapped sign, outdoor lighting, and garbage receptacles for drawing site plans of parking lots and site management. The library Trees and plants contains shapes of trees, hedges, groundcovers, greenery, and shrubbery for drawing site plans, landscape architecture, lawns, gardens, yards, parks planning, groundskeeping, landscape design, and arboretums. Use these 3 libraries for ConceptDraw DIAGRAM diagramming and vector drawing software to draw site design plans and equipment layouts. These design elements library are included in Site Plans solution from Building Plans area of ConceptDraw Solution Park. Solution Building Plans from ConceptDraw Solution Park provides vector stencils libraries with design elements for drawing Site Plans.